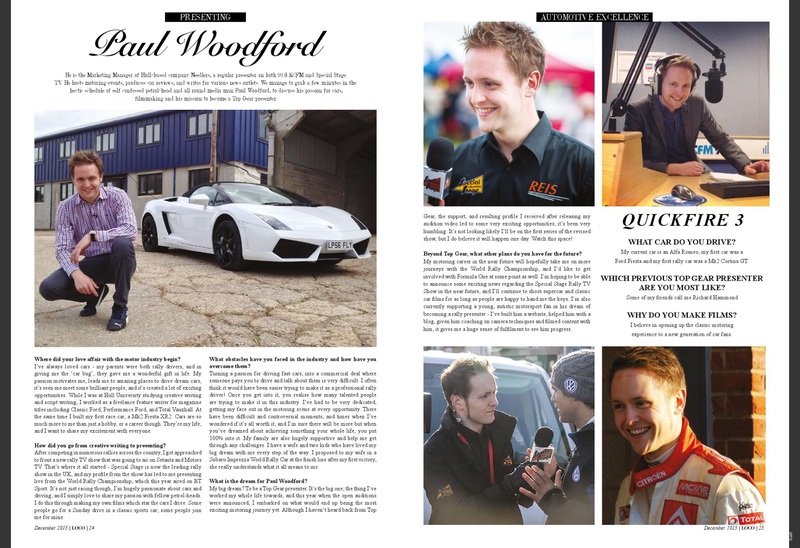 After a hectic year of producing motoring films, presenting rally TV shows and blogging about my motoring experiences, I’m ending 2015 in print thanks to East Yorkshire fashion and lifestyle publication, Loco Magazine. The piece is a Q&A about my career so far, how it all started, and my ambitions for the future. They pretty much nailed it, and importantly for me the feature also touches on where I am in my career away from motoring too, acknowledging my marketing management role at Needlers and my radio show on 99.8 KCFM. My feature in Loco Magazine is part of a special motoring-themed issue, with Ginetta GT racing driver, Mike Simpson on the cover. It’s great to see local lifestyle publications focusing on motoring and motorsport, and I’m grateful to the Editor for getting in touch. I’m hoping to be able to bring you some more motoring-related news regarding Loco Magazine in the near future. But while I work on that, you can read the magazine online, HERE. For the latest updates, don’t forget to join me on Twitter, Facebook and Instagram. Let’s talk cars!